A last post before I leave for a well deserved trip to Tuscany! Our bathroom is showing some serious wear and tear. It’s a shame really because it’s not that old. It was installed and tiled in 2007, and looked good for about ten minutes before the tiles started fading. 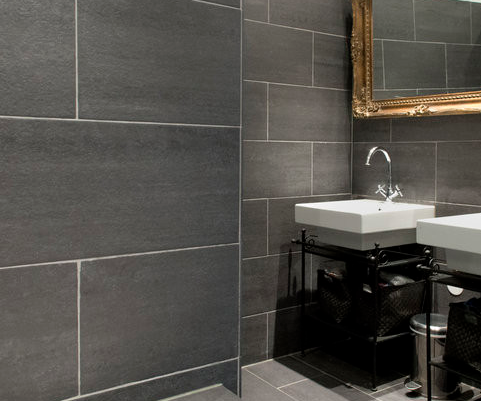 They are big grey slate tiles, and to be honest; I am a bit fed up with those anyway. They were a bit too much of a trend so you now see them in all renovations done between 2006 and 2010. Time for a re-tile it is. You can see the faded tiles in the shower. They tick me off each day and it’s just not worth it. We are leaving the grey slate on the walls, and I am thinking of treating them with an oil finish to make them stand out. For the floor I am either thinking black and white, or just white. 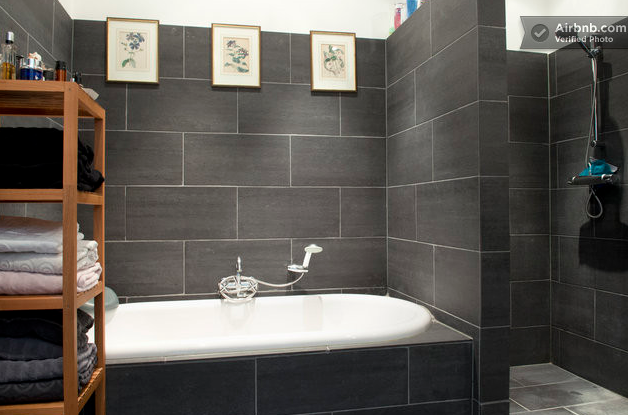 Either way, a smaller tile as I think the contrast with the bigger grey slate will look great. Have a look at some of the pictures I collected on my pinterest moodboard. 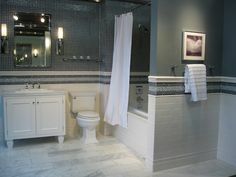 I looked for pictures with a distinct darker colour on the walls to highlight the contrast between the floor and walls. Love this. 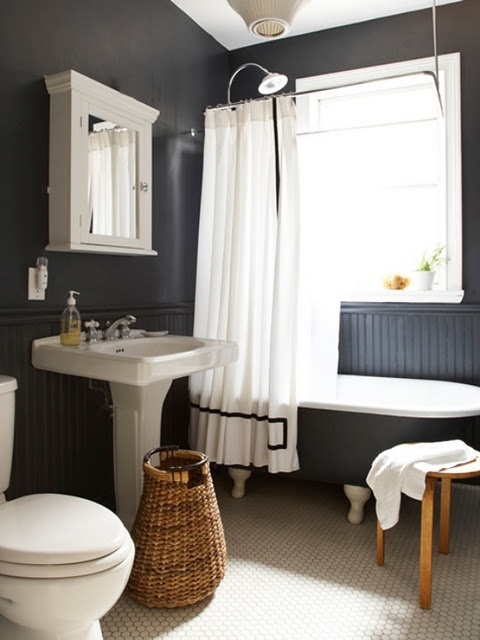 It obviously means I’ll have to infuse my bathroom with a few more brocante or antique-ish items, but I guess I could give our bathroom a similar feel. Painting the bathroom rack black or dark grey/blue is a start. Maybe add a small chair? I also thought of maybe going for a more elaborate floor with a massive contrast effect. But as we are thinking of maybe putting up the house for sale next year, this might not be too great an idea…..
Just look at the floor in this one as the rest is a bit tacky. 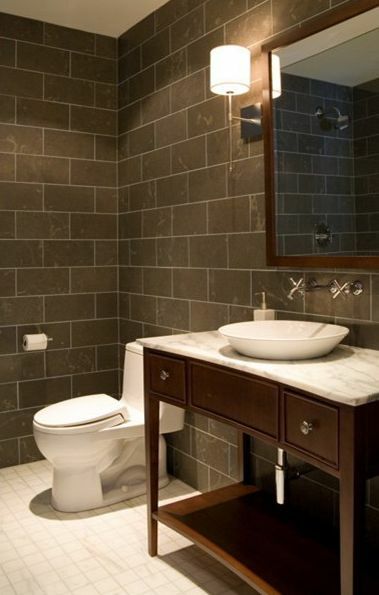 I do have a thing for marble though….. I bet this would look great with the rugged, dark slate…. But I am dreading even thinking of the final invoice…. What do you reckon I should do? 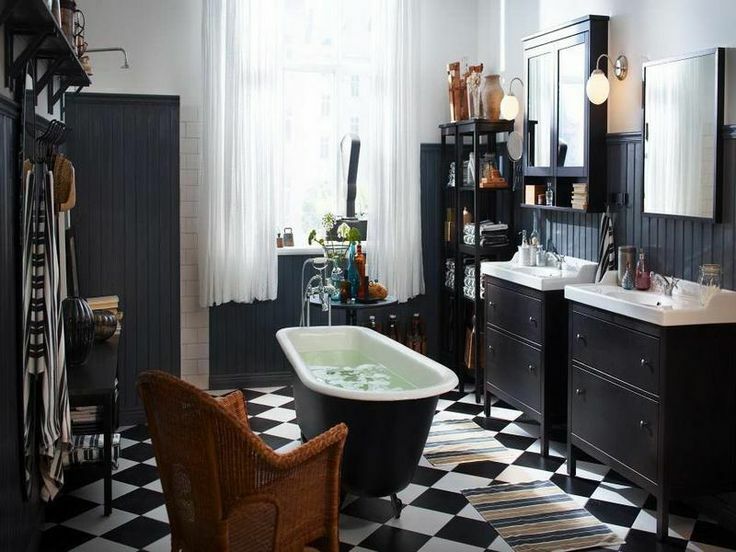 This entry was posted in General living and fun stuff, See how others live and tagged bathroom, bathroom tiles, black, Cheap, contrast, design, effect, grey slate, ideas, marble, slate, slate tiles, tiles, wear and tear, white. Bookmark the permalink.